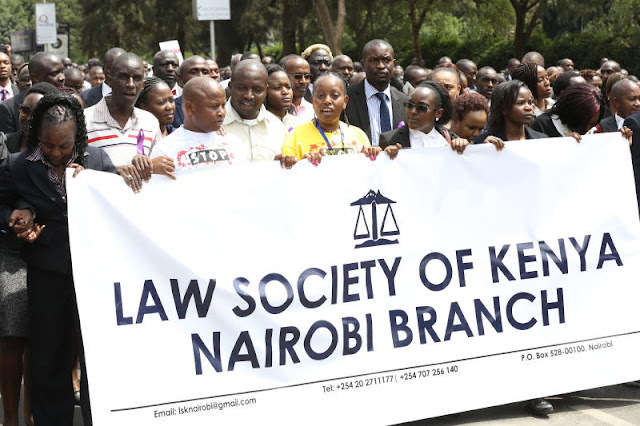 An offensive against the cartels within the Law Society of Kenya has begun, with critics saying everything around the law society needs to be checked. Kenyans were shocked when 4 out every 5 candidates that sat for the bar exams failed. Trending on Twitter on early Sunday morning, Kenyans asked questions on why the #LSKCartels continue to thrive. 36 Bloggers trending #LSKCartels. What has Allen Waiyaki Gichuhi done that is so repugnant to the cause of the status quo deep state elites who put him in office that he has to be paraded in the public square? sources indicate that about 1500 law students fail their exams every session. Resiting a single paper costs a staggering ksh.10,000 and remarking a single paper is Kshs.15,000. Thats quite a figure! #LSKCartels Last year @lawsocietykenya issued out a code of conduct for its advocates concerning dressing for court, but it seems more yet needs to be done in cleaning out its own profession for it to reclaim its coveted spot as the legal conscience of the country. Tweets mined from Twitter with reference to the #LSKCartels hashtag. OG Khaligraph Jones Is Going to Be a Dad Yaaaaaaaay!